In our family, we always have a pumpkin pie for thanksgiving dinner. Usually I make it or my Grandma Pat will make it and its always delicious! Last year I made a dairy free pumpkin pie with coconut milk and a strusel topping that was excellent, but this year we wanted to change it up a bit. Rock the boat. 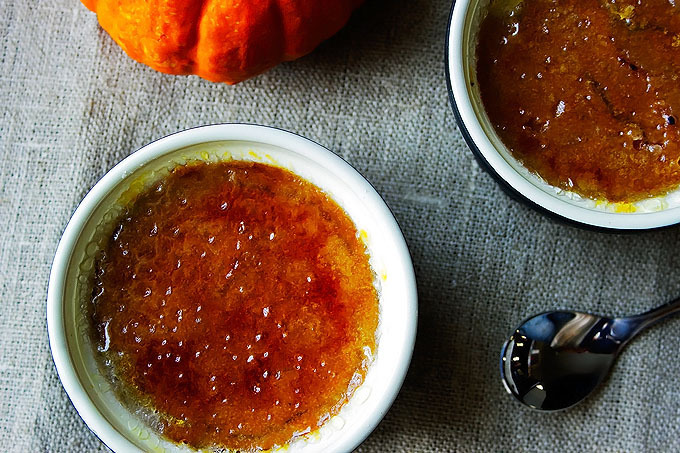 While looking for a pumpkin custard Debbie found a recipe for Pumpkin Crème Brûlée on The Kitchen that she said we absolutely had to try. So we adapted the recipe to suit our tastes and here it is… Basically, we doubled the spices, added bourbon and a vanilla bean. Delish! To be honest, I think Debbie just wanted to play with her little torch and then break through the hard layer of sugar. She was pretty impatient lol. I can’t really blame her though. That hard sugar layer is pretty spectacular! This dessert was even better than we thought it would be. 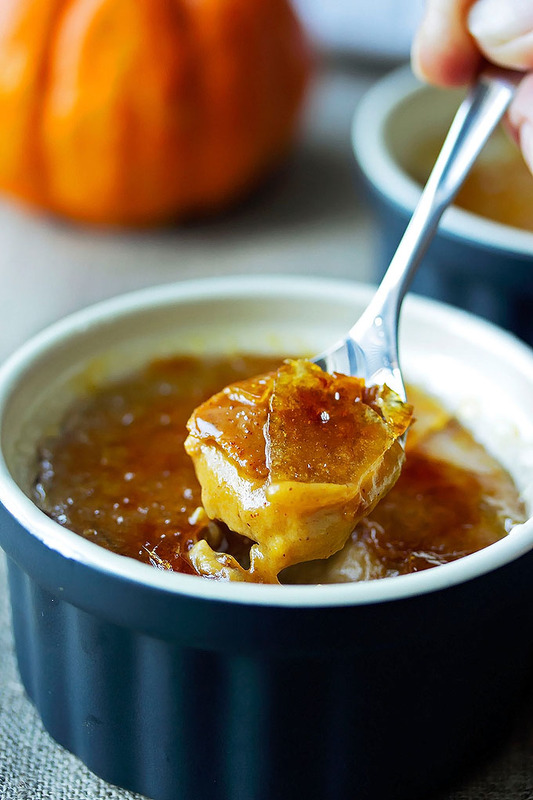 Whether you make this for thanksgiving dinner or just because, the smooth and creamy spiced pumpkin custard with a hint of bourbon and the crunch from the hard caramelized sugar is the perfect fall treat. You won’t even miss the pie! First cook the pumpkin. Cut it in half and scoop out all the seeds. Place it face down on a foil lined baking tray and cook in a 350 degree oven for 40 - 50 mins or until its nice and soft. 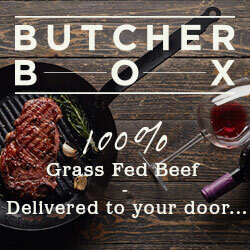 Scoop out the flesh and put it in a food processor or in a blender and puree until smooth. Set aside. In a large bowl, combine the cornstarch and the salt. Add a little bit of cream to make a paste and whisk until there are no lumps. Add the rest of the cream and whisk well making sure there are no lumps. Add all the egg yolks and whisk well to combine. Set aside. In a medium pot, add the pumpkin, the spices, bourbon, sugar and milk. 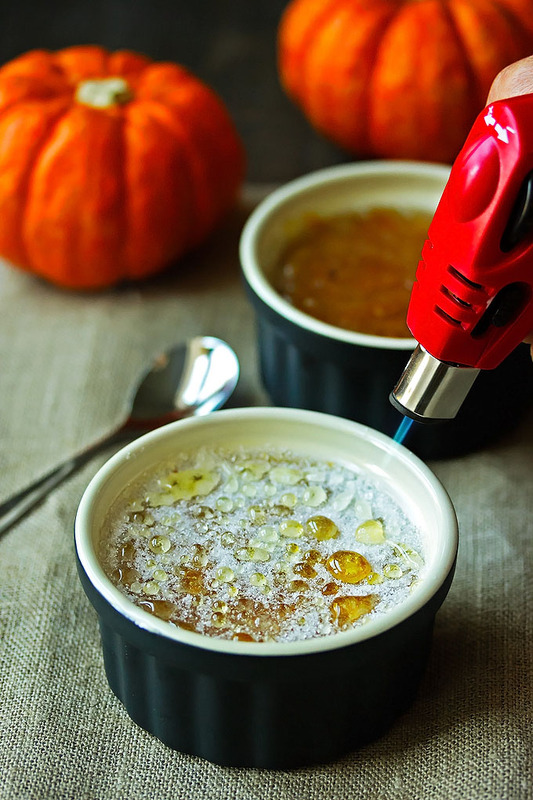 Slice the vanilla bean in half and scrape out the sticky vanilla and add it to the pumpkin. Cook on medium heat until it is warmed through and almost boiling. Add the pumpkin mixture slowly to the egg mixture, whisking as you add it. Pour it back into the pot and heat the whole thing to a boil whisking the whole time. Boil for 2 mins and remove it from the heat. 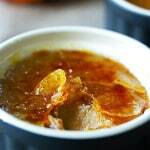 Pour into ramekins and chill in the fridge for 2 hours up to overnight. Don't cover them. You want them to form a little skin on top. 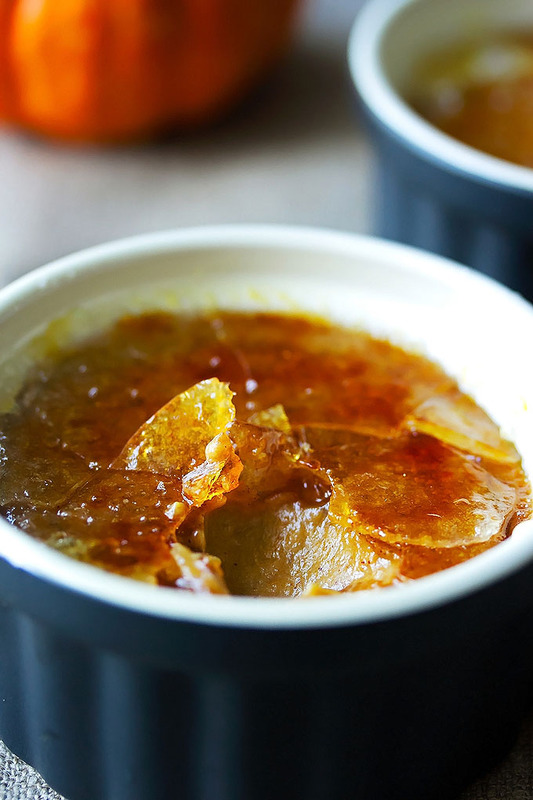 When you are ready to serve them, sprinkle sugar all over the top of each ramekin and make sure its spread evenly. You want kind of a thick layer so that it gets a nice crunchy top. 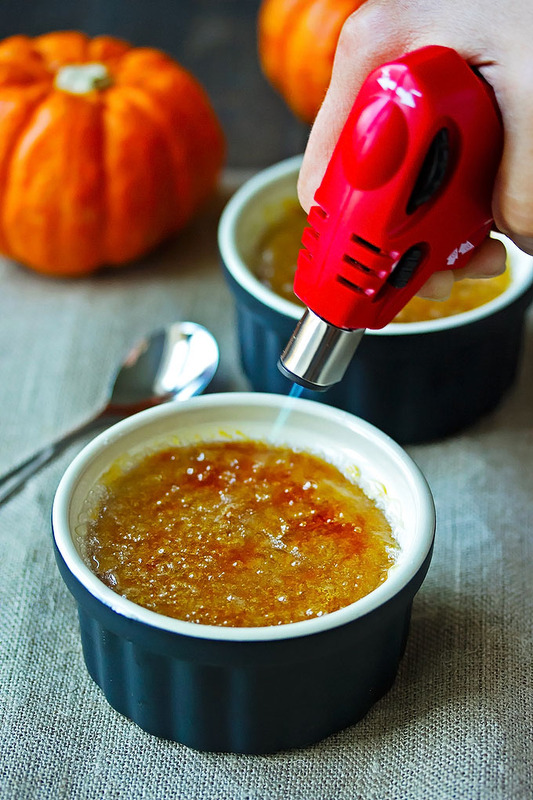 Using a torch, melt the sugar until it gets all bubbly and caramelized. Make sure all the sugar gets melted. Let it sit for a few mins until it gets nice and hard.